Google Earth added new functionality this week that lets you search the world by geographical location and find books that reference that location. 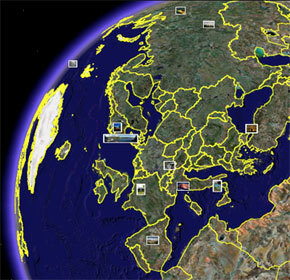 So, for example, if you open Google Earth and type "London," you will be presented with numerous yellow book icons. Click on any one of them, and Google will show you instances where books specifically reference "London." (In this case, I found works by Thomas Hobbes and John Locke, two of England's most important political thinkers.) All of the books presented here are in the public domain, which means that you can continue to explore the complete text, courtesy of Google, should you want to. A nice touch. There is a certain "gee whiz" factor to this new application, no doubt. But how widely it will be used is another story. Search for "Boston" and you will get more book icons than you can handle. And will you want to mouse over each one to find a potentially useful text? Doubtful. And the problem will only get worse as Google Book Search, a partner in the project, digitizes more texts. A more effective solution, it seems, is simply to head over to Google Book Search and conduct a good, old fashioned search, then read through the more legibly-presented and ranked search results. That's so 1990s, I know. Please note that to use this new functionality, you should download a recent version of Google Earth, and check off "Google Book Search" in the "Featured Content" section under "Layers." You can get more information from Google here and here. If I am missing something important about this new feature -- that is, if I'm wrong about its utility -- feel free to say so. The Google folks are smart, and I wouldn't be surprised if they're seeing something that I'm not. The jury on GeoMapping books remains out for now. I agree that in it’s current form this is not very useful. However, if you get the basics of this right it would be easy to expand into something more interesting. What if this was filtered down to just the books that you had read? Don’t forget that Amazon orders go through your gmail account. Or what if these were just non-fiction books that were relevant to travel? It might be nice to replace canned travel guides with actual narrative from locals past and present. I do trust all the concepts you’ve offered to your post. They are really convincing and can certainly work. Still, the posts are too brief for novices. Could you please lengthen them a bit from subsequent time? Thanks for the post.